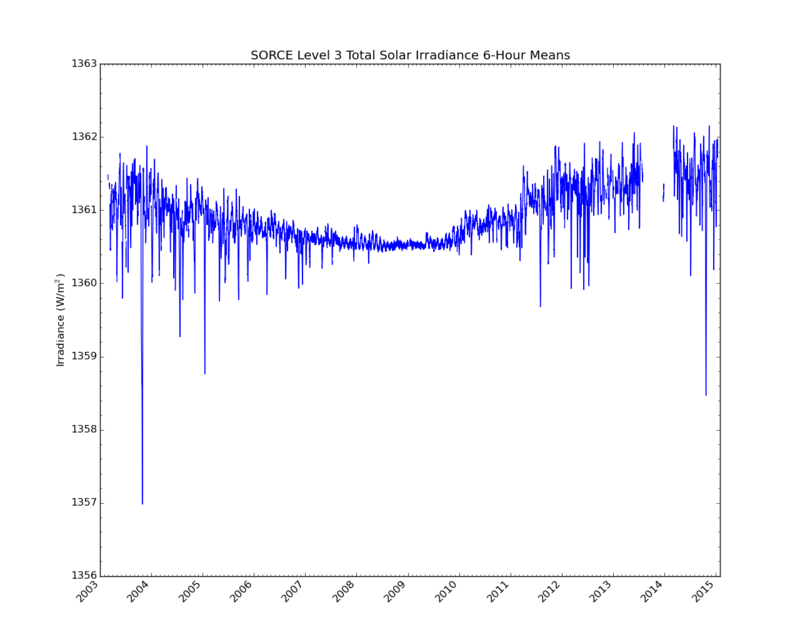 The Total Solar Irradiance (TSI) data set SOR3TSI6 contains the total solar irradiance (a.k.a solar constant) data collected by the Total Irradiance Monitor (TIM) instrument covering the full wavelength spectrum averaged at 6-hour intervals. The data are normalized to one astronomical unit (1 AU). The TIM instrument measures the Total Solar Irradiance (TSI), monitoring changes in incident sunlight to the Earth's atmosphere using an ambient temperature active cavity radiometer to a designed absolute accuracy of 100 parts per million (ppm, 1 ppm=0.0001% at 1-sigma) and a precision and long-term relative accuracy of 10 ppm per year. Due to the small size these data and to maximize ease of use to end-users, each delivered TSI product contains science results for the entire mission. Updates to Level 3 TSI data occur monthly in order to reduce repeated delivery of data. SORCE No campaigns listed. No dates provided.